Some may say that there isn’t as much of a need for storage outside, since the inside is where most of a family’s belongings are. 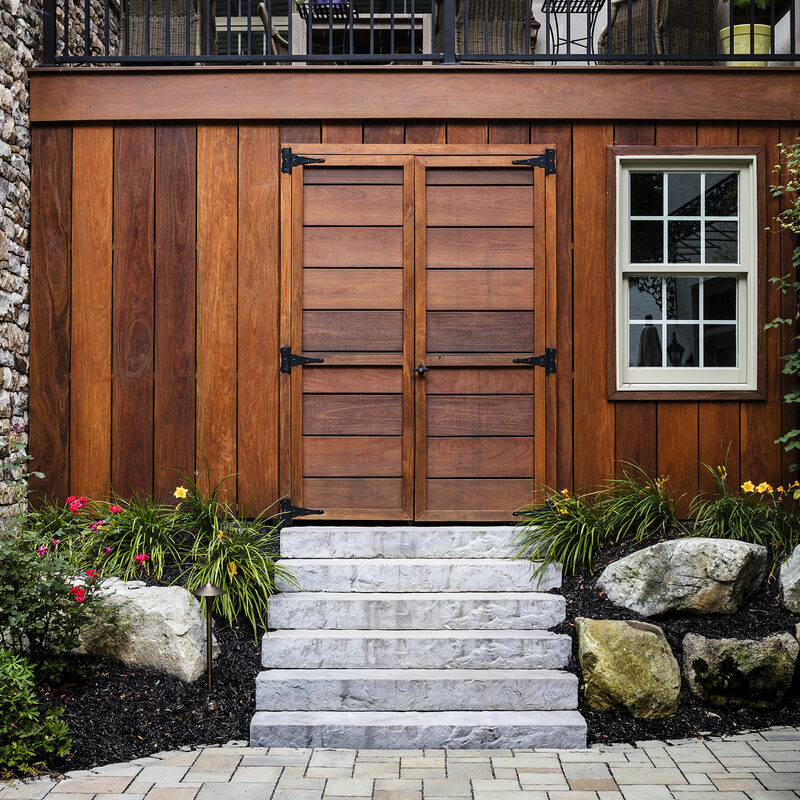 However, with more and more homeowners transforming their backyards into outdoor living spaces and paying equal attention to these exterior rooms, outdoor storage will quickly prove to be a huge advantage within your landscape design. Just take a minute to think about all the things outside that need their own home: lawn mowers and bicycles, tools and toys, cushions and pillows…the list goes on. 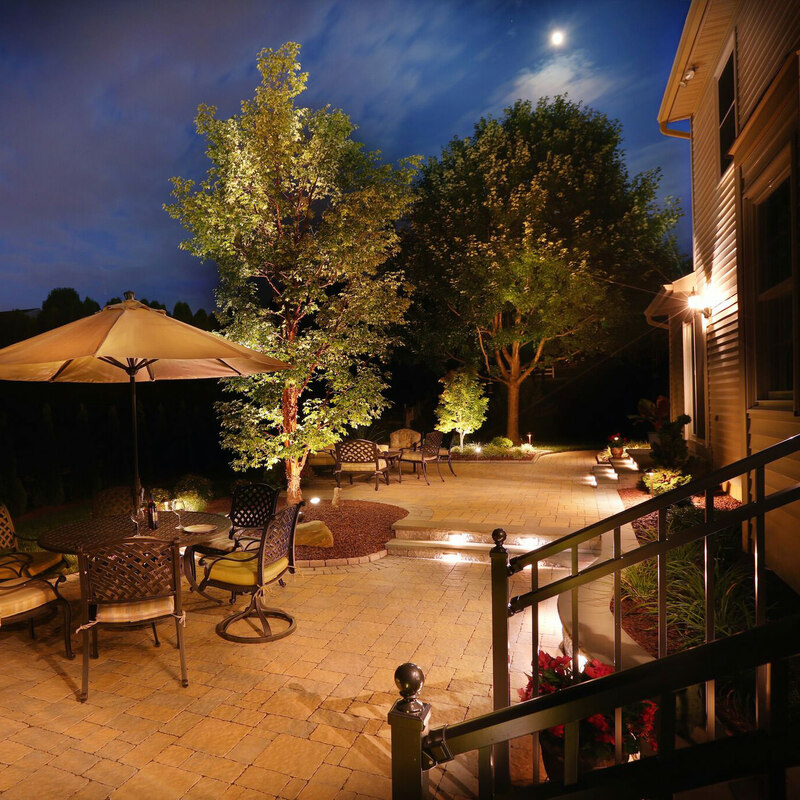 Now, take another minute to imagine your outdoor space free of the clutter where everything has its place and breathe a sigh of relief. Outdoor storage doesn’t have to mean big plastic bins or wood plank storage fences, there are plenty of ways to find stylish hiding places for all your accoutrements. You’ve heard about utilizing the space under your main staircase inside the house, and that very idea can also carry over to your deck staircase as well! The perfect example can be seen in this MasterPLAN project in Royersford, PA. Take notice to the switchback staircase in the background. 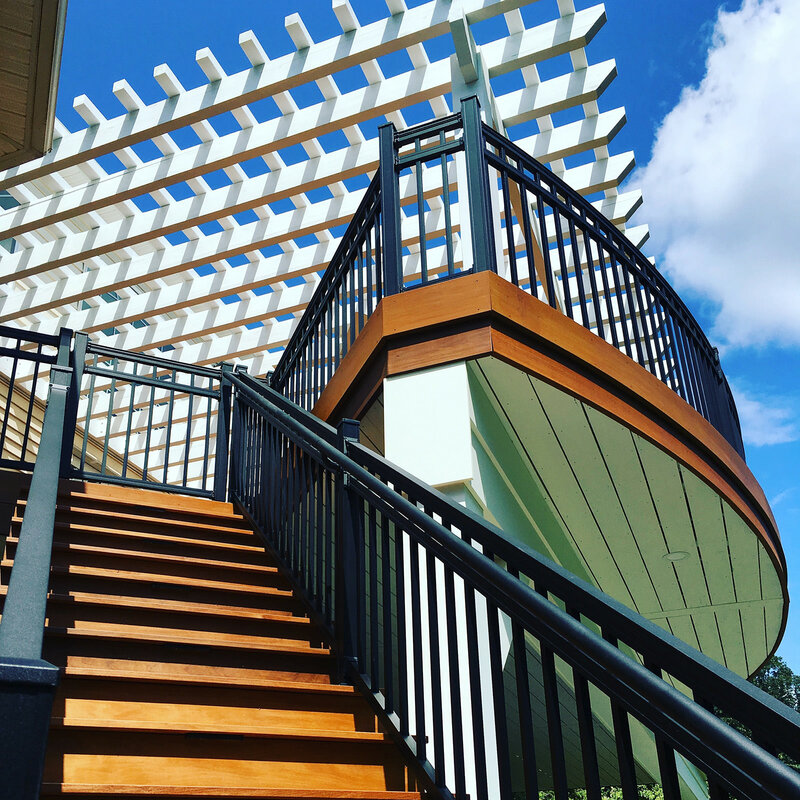 While this could have remained a simple staircase leading to the supper deck kitchen and lounge area, the client fell in love with MasterPLAN’s idea to capitalize on this real estate and have it serve as storage for the swimming pool and yard toys. 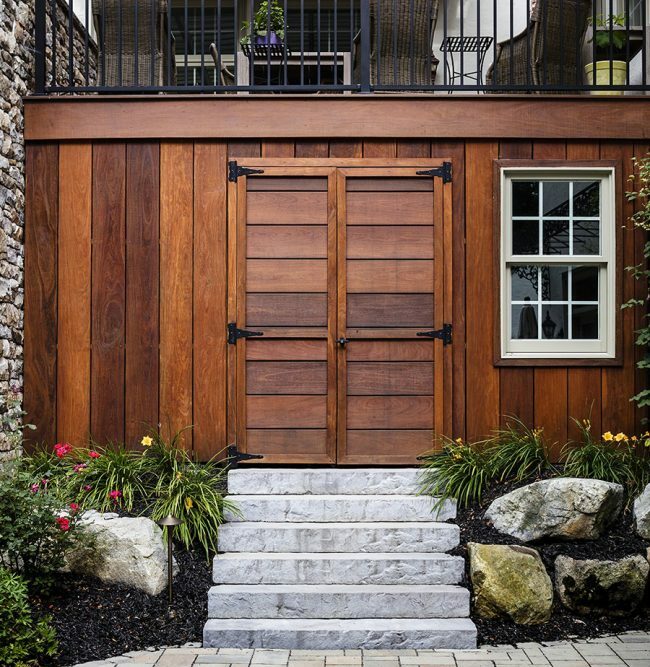 By treating this storage as a part of the deck itself, the area is almost disguised and it’s possible to miss the doors if you aren’t looking for the latch. It’s this kind of forethought and attention to detail that takes an outdoor project to the next level! If an under-staircase storage area doesn’t appeal to you, or you are in need of larger accommodations, you could always consider under deck storage! 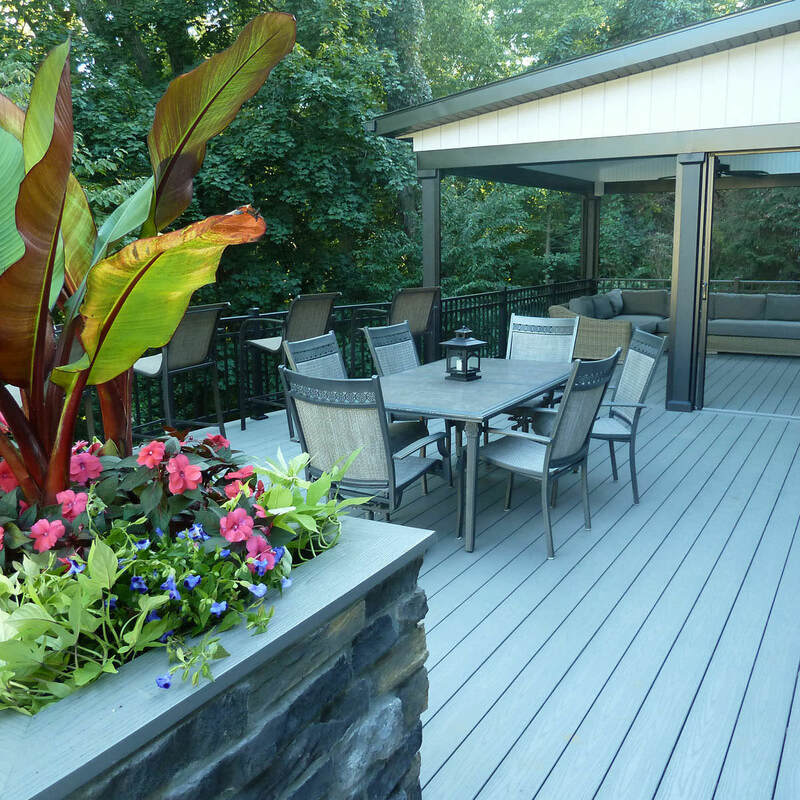 As shown in this MasterPLAN project in Center Valley, the under-deck doors are handsomely incorporated into the side of the rich and beautiful Cumaru tropical hardwood deck. With an area of approx. 16’ x 9’,this homeowner is guaranteed to have all the storage space they need to keep their backyard clutter-free and belongings protected from the elements! Smaller space? No problem! 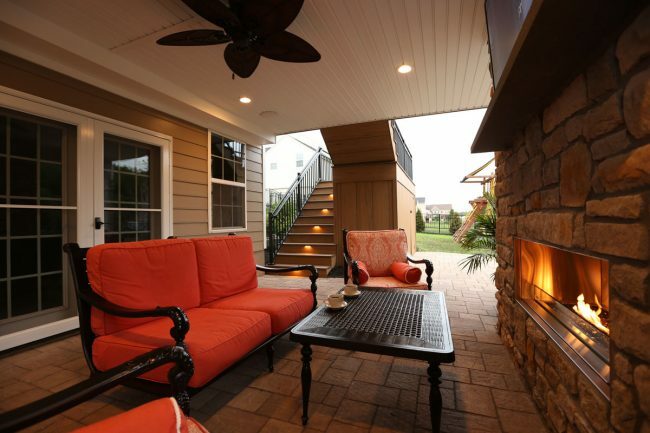 For those who have an outdoor living space that doesn’t have or can’t incorporate a deck, all hope is not lost. Strategizing and selected furniture with under seat storage just might do the trick. These creative pieces of furniture can store the seat cushions away when not in use, or act as extra storage during an evening of entertaining. Want to make your space seamless and cohesive? 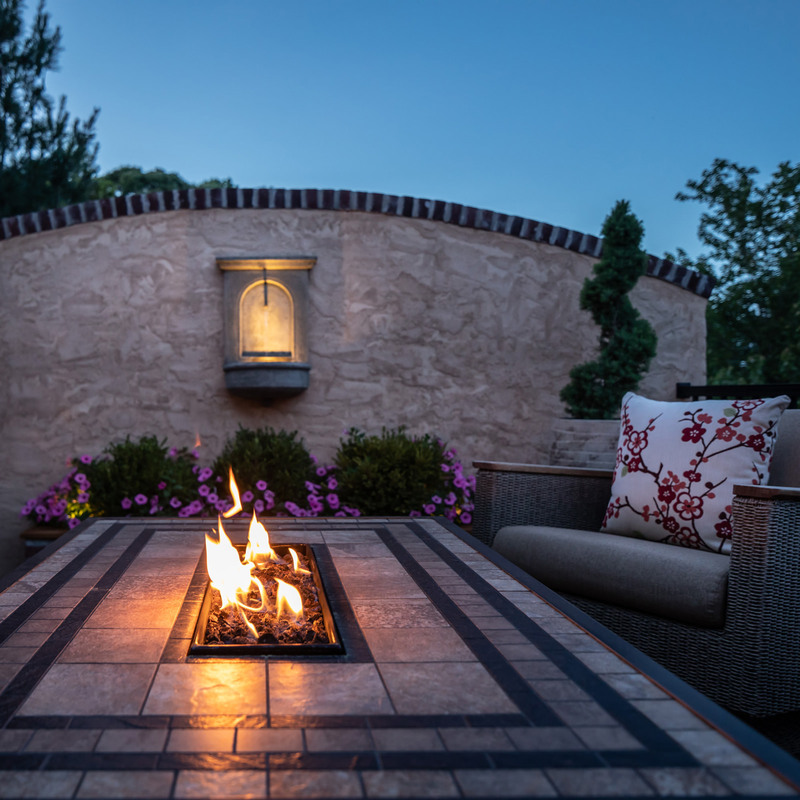 Talk to your landscape designer about incorporating built-in furniture pieces, using like materials that exist throughout your property. 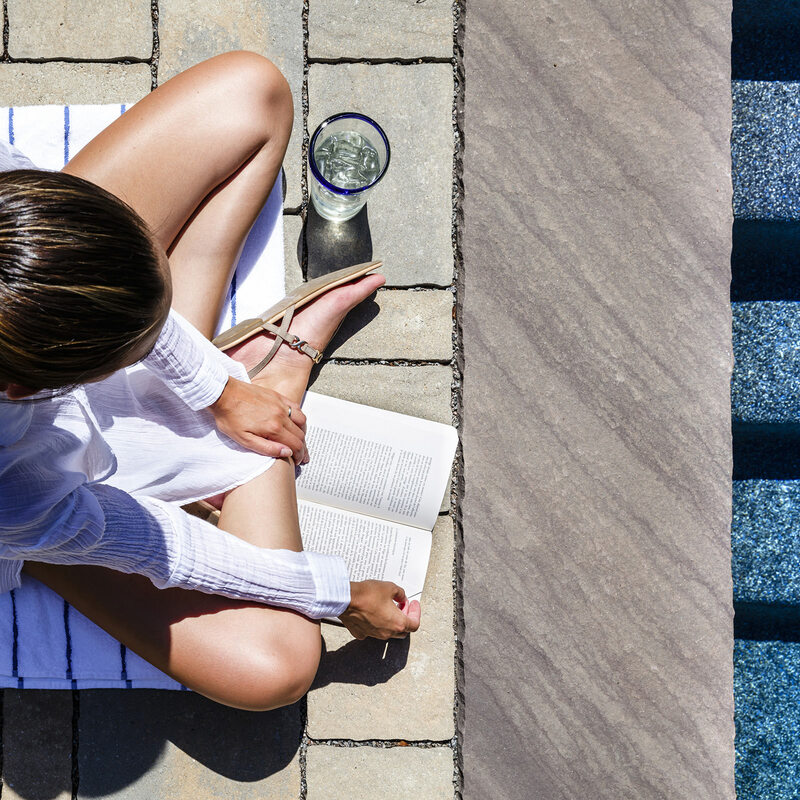 Custom built-in furniture pieces are fully customizable for your personal storage needs and beautifully blend into an outdoor living space, presenting a streamlined, clean, minimalistic and space-saving approach to the space! 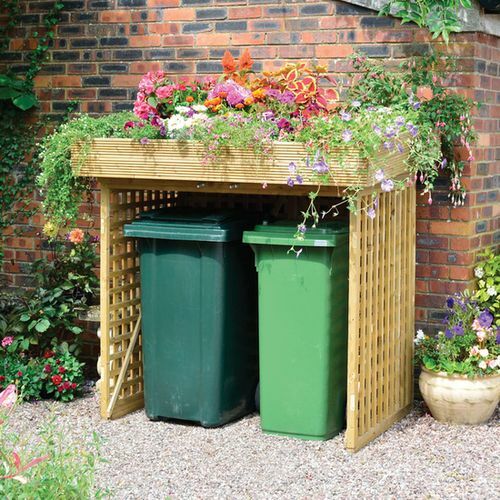 In continued practicality of your outdoor space, it doesn’t hurt to explore your options for a built-in garbage can storage area when creating your backyard transformation! Trash cans are obviously a necessity but also unsightly and bulky plastic eyesores! 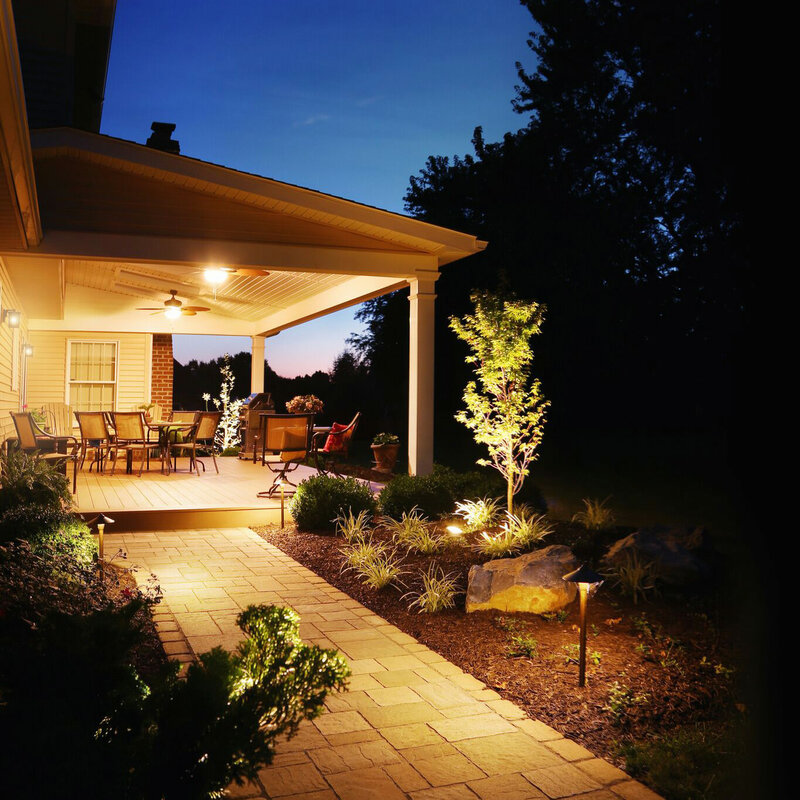 Having your landscape designer integrate a wooden or vinyl storage area for these monstrosities will keep your property looking pristine and can also perform a double duty. 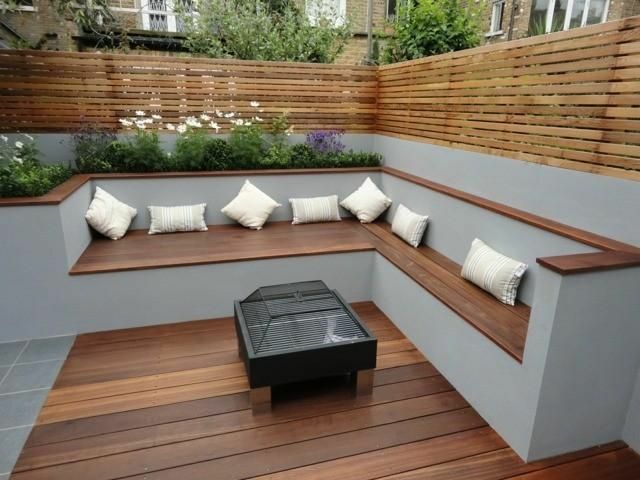 Perhaps you would like to have this feature double as a privacy fence, or act as a divider wall within your design, opt to build planters flanking the sides of this outdoor feature, or maybe you would like to have a larger fence area where you can store the kid’s scooters and yard games; feel free to get creative with your outdoor storage, it will only enhance your space for the long run! 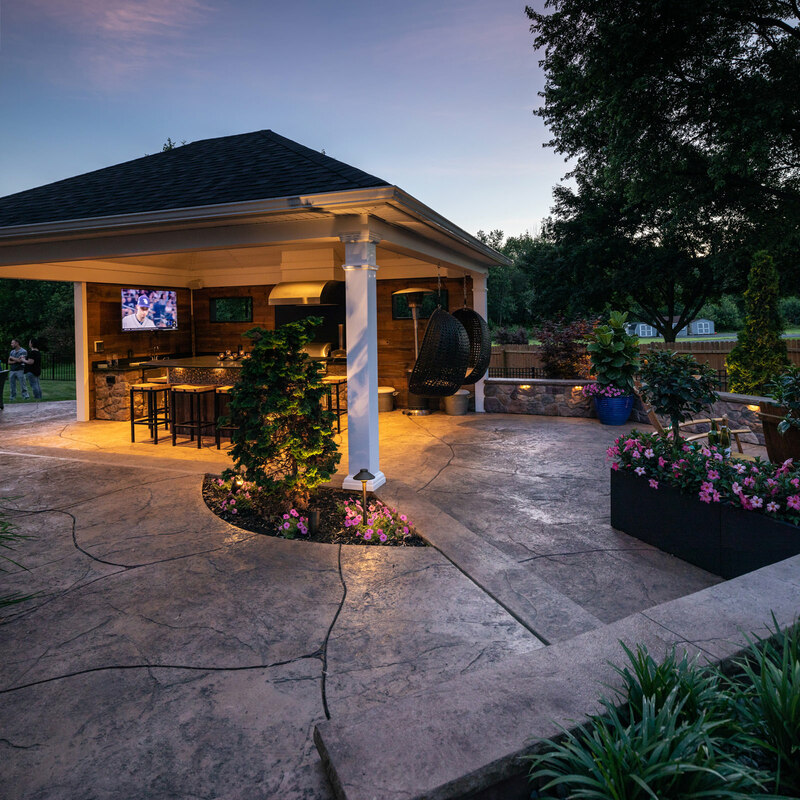 Whatever your outdoor needs, from re-imagining your current backyard to starting from scratch, MasterPLAN Outdoor Living would love to sit down and explore all outdoor options for your property, family and lifestyle! 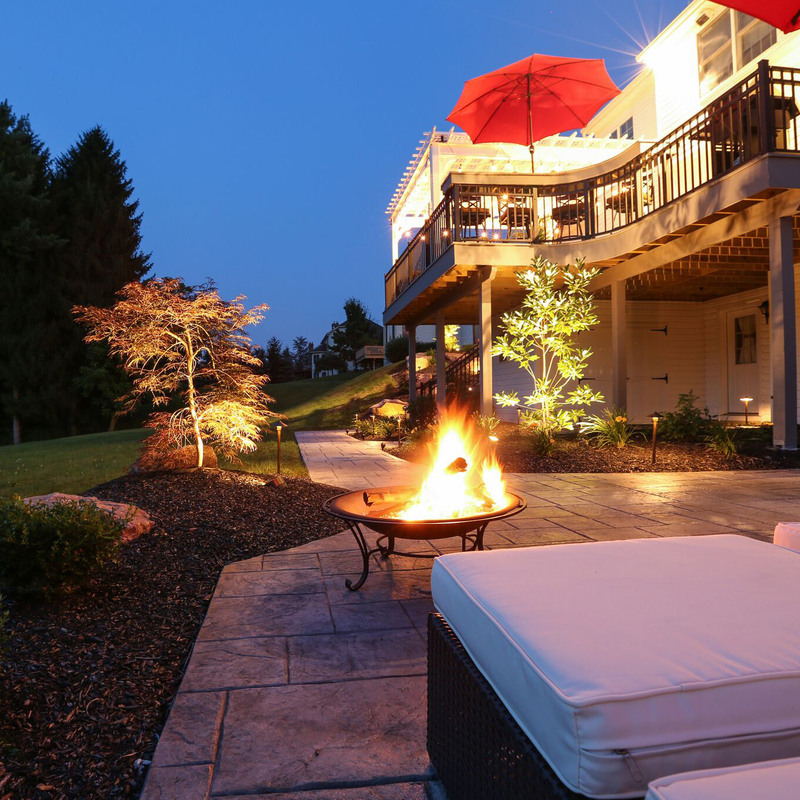 Serving the Poconos, Lehigh Valley through the Main Line of Philadelphia and western New Jersey, MasterPLAN’s creative custom design and installation solutions are sure to transform your outdoor living dreams into your outdoor living reality. Feel free to reach out to MasterPLAN when you are ready to discuss the full potential for your property; when you are ready to chat, we are ready to listen!